Getting your daily greens is an important part of living a healthy lifestyle, but is all too easy to overlook. Almost 75% of Americans don’t consume enough fruits and vegetables. 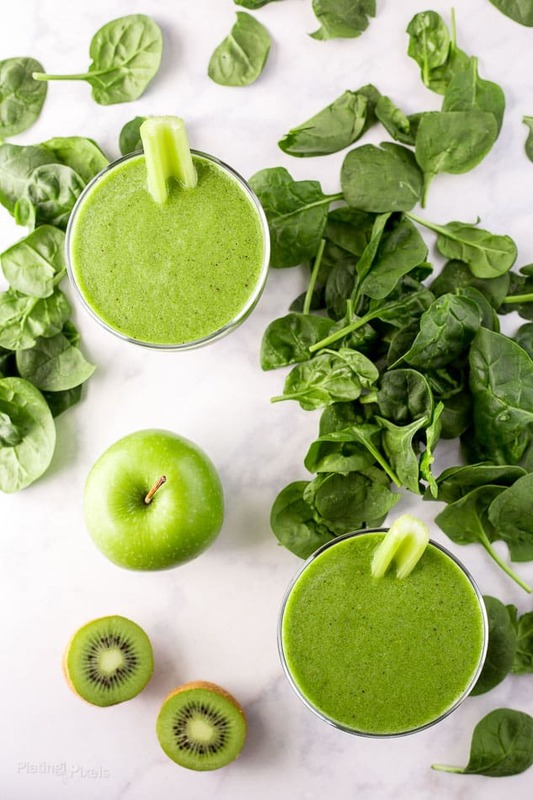 Learn simple tips on How to Get Your Daily Greens, plus a recipe for Super Greens Breakfast Smoothie. 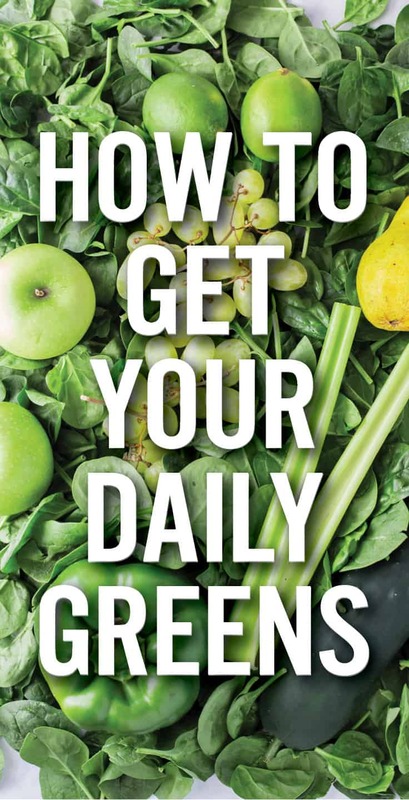 Whether it’s a busy schedule, produce availability, taste preferences or a myriad of other variables preventing you, a little bit of knowledge and planning will go a long way to ensure you’re getting your daily greens. The daily recommended serving is 5-9 fruits and vegetables. That equates to at least 2 cups of fruit and 2 ½ cups of vegetables. Until you’re comfortable guessing the serving size of produce, an easy way to measure is to chop or slice, then measure that amount. Generally one fruit is a cup. However when measuring leafy greens, 2 cups equals 1 cup, unless you pack tightly. 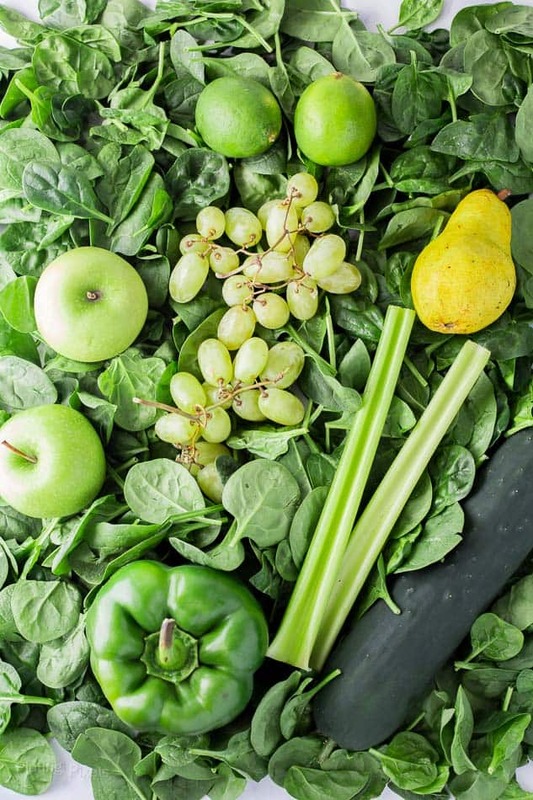 In this post I’ll cover the health benefits of greens, some of my favorite produce, and easy ways to enjoy them at home or on the go. Greens are full of vitamins and minerals including iron, folates, magnesium, antioxidants, vitamins E, C, K and A. 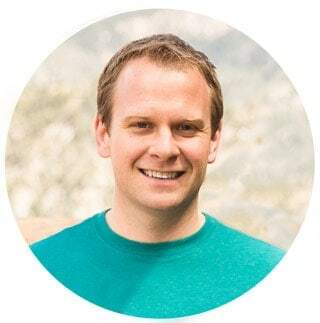 These improve all aspects of your health including energy levels, weight control, eyesight, bone density, skin, mood, memory, and hair and muscle growth. I take multivitamins as well, but greens are an easy and tasty way to get a lot of your required vitamins and minerals. Some of my favorite greens are spinach, kale, broccoli, green beans, grapes, apples, pears, kiwi, celery, cilantro, and cucumbers. Try them as snacks, appetizers, sides or part of your entrees. Roasting is a wonderful way to enjoy starchy greens like broccoli. Aim to have vegetables and/or fruit with every meal. If you’re busy or don’t have time to prep portioned servings, I find it’s best to keep fresh fruits and veggies on hand. Simply pack a few to go with your lunch or as a healthy snack. Storing frozen fruits and vegetables is another great way to keep fresh produce stocked. It’s flash frozen at the peak of ripeness and will store in your freezer for months or longer. 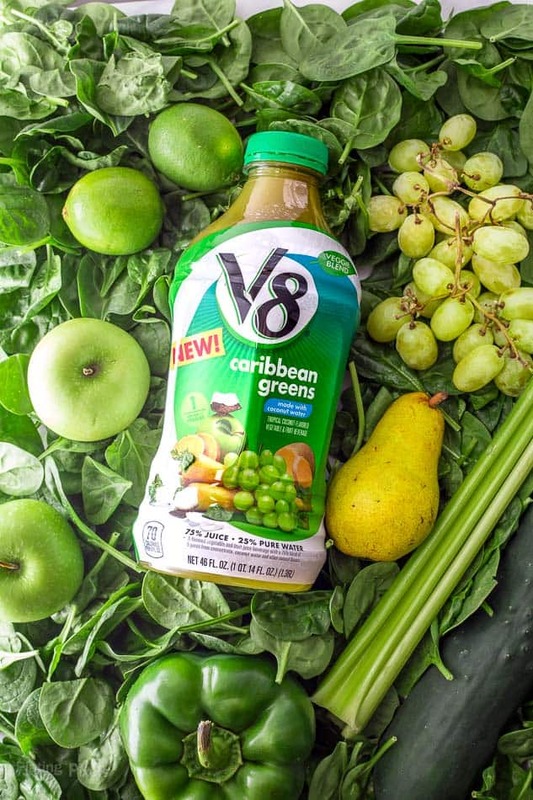 Another easy and affordable way to help reach your daily greens is V8® Veggie Blends: Caribbean Greens. The new flavors are available at your local Walmart in a 46-ounce or 12-ounce bottles. Look for the Berry Bliss flavor as well. It’s made with fresh fruits, vegetables and coconut water, without added sugar, artificial flavors, colors or preservatives. Plus it has plenty of antioxidants and vitamins A, C & E for added health benefits. Each bottle includes fresh spinach, carrots, apples, coconut, sweet potatoes and grapes. Even though it’s naturally sweetened and full of greens, it’s incredibly tasty. Drink it on it’s own as a nourishing treat or part of a greens smoothie. 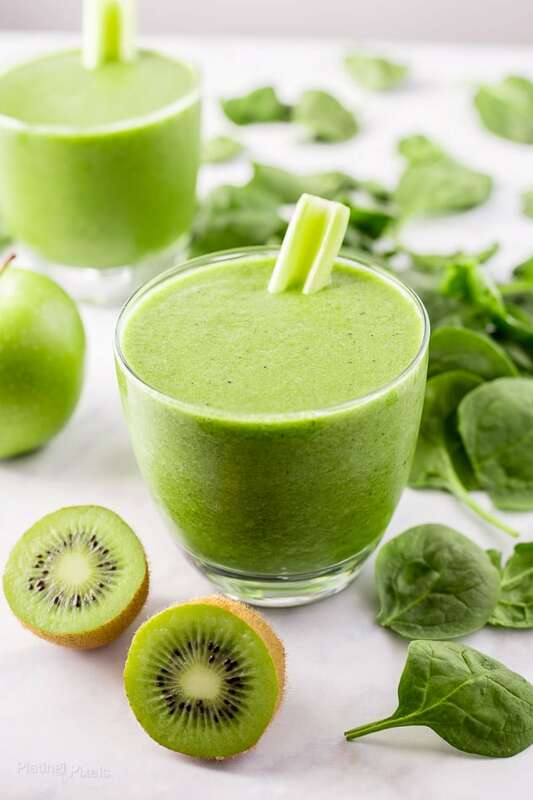 Simply add it to fresh fruits and spinach and you have a simple Super Greens Breakfast Smoothie. 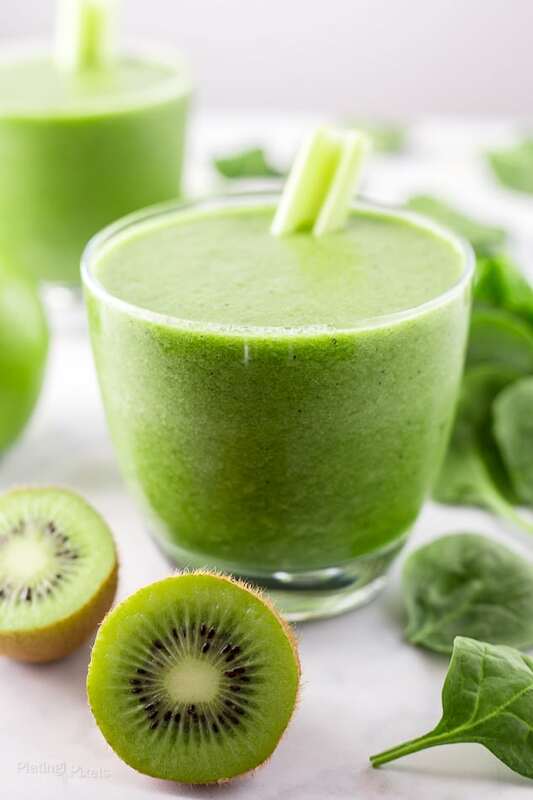 It’s a naturally sweetened green smoothie full of all kinds of goodness. Add your favorite protein powder if desired. Perfect for breakfast or taking on the go as a work snack. Add all ingredients to a heavy duty blender like a vitamix or bullet. Blend on high until well combined and smooth, about 1 minute. Add more liquid for smoothie, or more frozen banana to make thicker. We eat copious amounts of green vegetables (it’s pretty much all my toddler wants to eat!) but I know many people who do not, so this is a great, easy option for them. Very nice photography along with some great suggestions for good health. Looks and sounds amazing! 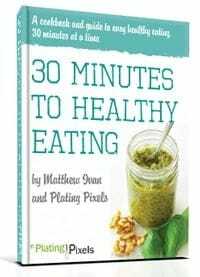 I love fast ways to get a lot of nutrition, this is perfect! Thanks David! If all my fruits and veggies tasted like this smoothie it would be so easy!